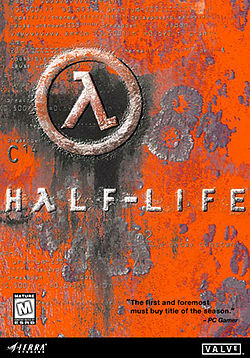 The winner of more than 50 PC Game of the Year awards, Half Life is often considered one of the greatest video games of all time. IGN has claimed that the history of the first-person shooter genre can be broken down “pretty cleanly into pre-Half-Life and post-Half-Life eras.” Marc Laidlaw, who had been interested in interactive computer games ever since becoming obsessed with Myst and who had previously written the tie-in novel The Third Force for the computer adventure game Gadget, joined Valve Software and worked on the story and level design of Half-Life. The game follows the perils of Dr. Gordon Freeman, who must overcome interdimensional alien invaders after a teleportation experiment goes disastrously awry. Half-Life has been praised for its graphics, innovative gameplay, and involving storytelling. Marc Laidlaw also worked on Half-Life‘s three expansions, as well as the successful 2004 sequel, Half-Life 2.